Pink and white pattern Easter pin badge. 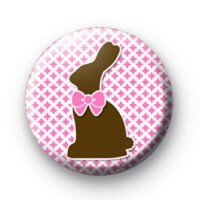 This sweet 25mm Easter themed badge has a chocolate style Easter bunny with a pink bow. It is a sweet, classic Easter design and one that would make a thoughtful alternative Easter gift. We have hundreds of fun, bright and classic Easter badges in the shop, including Easter egg badges, lots of Easter bunny badges and cute Spring Easter chick designs. Our badges are popular with schools and parents each year who tend to buy them to give out to pupils and include in Easter Egg Hunts. Have a browse through our easter badge category, or use the search box to find similar designs. 25mm badge made by hand in the UK.